Disney World is Pretty Sweet! Next we “thunk” some happy thoughts and flew over to Storybook Treats in Fantasyland, Magic Kingdom! 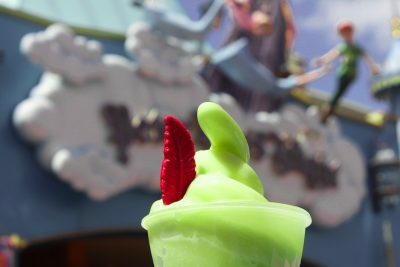 The Peter Pan Float is lime soft serve floating in Sprite and topped with a red chocolate feather(just like the one on Peter Pan’s hat). Was is photogenic? Absolutely! 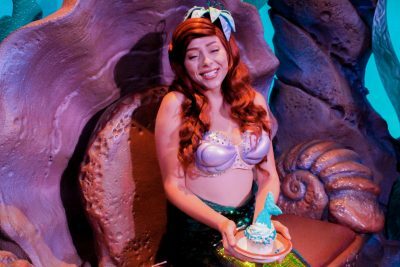 This may be one of the most adorable Disney treats ever in my book. Was it delicious? In all honestly this treat may rival a Dole Whip for me. It’s fresh, cool, and refreshing on a steamy Disney day. The Storytelling of this treat makes me smile. It’s a Peter Pan ‘Float’ (because Peter Pan floats…or rather flies) This treat can get a little messy so be sure to grab some napkins! Something else good to know if you have food preferences or allergies, this treat is gluten and dairy free and is vegan other than the chocolate feather. Get your iPhones out and prepare your hashtags, pals, because we are headed for the most popular Magic Kingdom photo spot other than Cinderella Castle, the ‘Purple Wall’! The Purple Wall gained in popularity a few years ago when the vivid color and ‘studio’ type natural lighting took over Instagram. 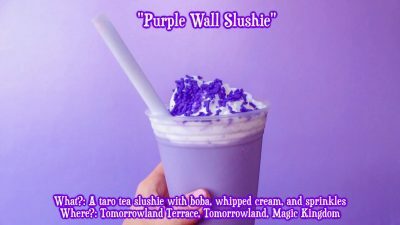 This location has become so well known that it has its own geographical location on many social media platforms, its own Disney Photopass opportunity, and now its own signature drink, the Purple Wall Slushy! The drink is as trendy as the location its named after. The Purple Wall Slushy is a Taro Tea slushy with Tapioca Boba. This drink is a great edition to your instagram photoshoot and matches the purple wall perfectly! As for taste it really depends on your personal taste! If you love boba tea go for it, if not, maybe wait on this one. This treat is dairy and gluten free if you ask for no whipped cream! Our final stop at Magic Kingdom was Sleepy Hollow in Liberty Square. Now, one famous Disney stable is the Churro, this new treat takes the churro craze up a notch! The Churro Ice Cream Sandwich! Is your mouth watering already? 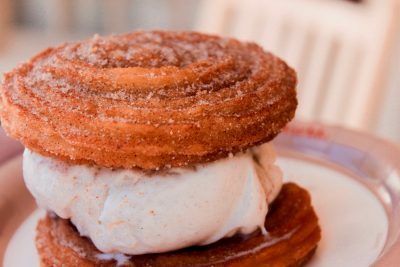 The Churro Ice Cream Sandwich is made of two warm twisted churros with a scoop of Vanilla Bean ice cream in the middle. While this treat can get pretty messy, it’s delicious, cool, and very sharable! The cinnamon-sugar mixes in with the ice cream making for a marvelous mix of flavors. This treat is photogenic but be sure to snap those photos fast because it can get pretty melty! Time to hop over to Hollywood Studios! We stopped by the Trolley Car Cafe(Hollywood Studios’ Starbucks) because there are two themed cupcakes here that are full of character! 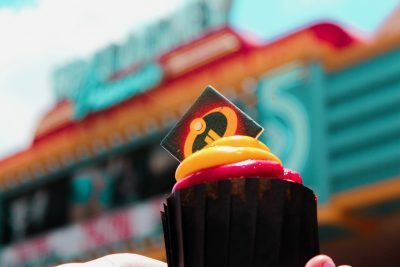 In celebration of Incredibles 2 that came out over the summer, Trolley Car Cafe is offering an ‘Incredibles Cupcake’, a red velvet cupcake with yellow and red icing and cream cheese filling! And carrying on the excitement of Toy Storyland, they have a Toy Story cupcake! The Toy Story cupcake is a chocolate cupcake with blue whipped icing and a white chocolate Pixar ball! 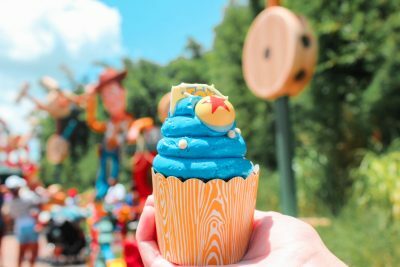 Both cupcakes are incredibly photogenic but our winner here is definitely the Toy Story cupcake! Next we headed off to an unexpected location, but one producing treats that are seen all over the web! All Star Sports Resort! In ‘The End Zone’ food court, along with many beautiful treats, lie 3 that in my opinion, are so great they belong in all the parks! 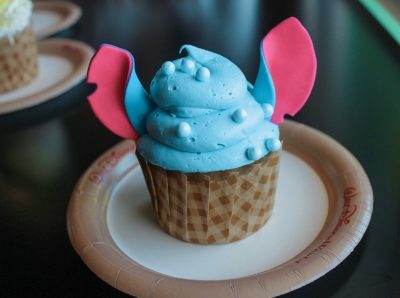 The first we tried was the Stitch cupcake. 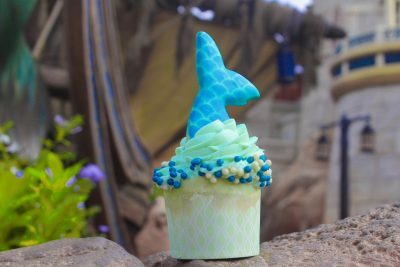 Rising in popularity, this cupcake is topped with fluffy blue icing, chocolate filling, and sugary Stitch ears! Adorable and always full of surprises, just like Stitch! 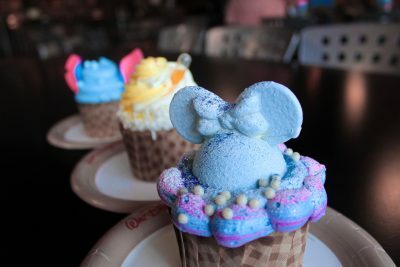 Minnie Mouse Cotton Candy Cupcake! Pineapple Whip Cupcake! This delicious baked treat is basically a Dole Whip in cupcake form! A pineapple cake cupcake, whipped pineapple swirl topping, and a pineapple juice infuser! Not only is this treat full of fresh flavors, but it may not event need an Instagram filter, it’s so beautiful! Our next treat is fully inspiring by the movie, Princess and the Frog. We traveled through the bayou over to Port Orleans Resort to discover if the Mickey Mouse Beignets lived up to their hype! 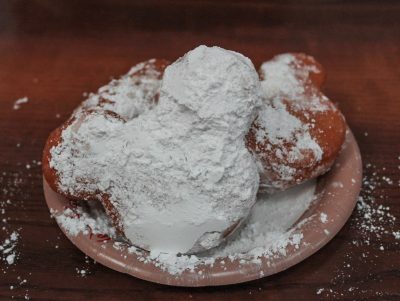 Mickey Mouse Beignets have been a staple at Disneyland Resort for years but are now offered at Walt Disney World Resort! Fluffy and fried to Mickey Mouse Perfection, these powdered sugar coated pastries are one for the hashtags! A great location to get your Disney fix on a budget, Disney Springs! 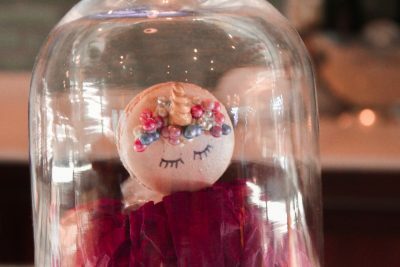 At Amorette’s Patisserie you will not be disappointed by the creative, Disney inspired, pastry art! There are many adorable treats offered at Amorette’s but one has been in more selfies than the rest! 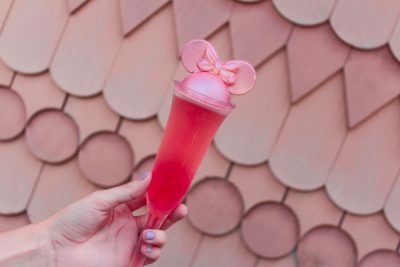 The Millennial Pink Champagne with white chocolate pink Minnie Mouse Ears has been the Instragamer’s go to! (This treat is for friends over 21, I had a good friend over 21 taste this treat for me) The drink is now also being offered in a beautiful page blue color dubbing the drink’s nick name the ‘Make It Pink’ or ‘Make It Blue’ drink. Another treat rising in popularity at the bakery is the Unicorn Macaroon! Our final stop on this sweet Disney adventure, Boardwalk Resort! The Boardwalk and other resorts connecting Epcot and Hollywood Studios have been rising in popularity due to the ‘color wall’ Instagram trend! 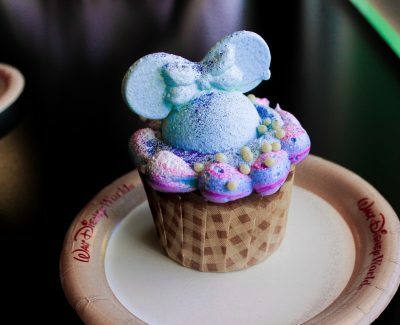 But the Boardwalk Bakery may be another reason this resort is becoming so popular… We’ve saved one of the best for last, The Mickey Mouse Unicorn Cupcake! This lemon flavored cupcake lacks nothing in presentation! Topped with whipped rainbow icing and surprising raspberry filling, this treat is absolutely not lacking in flavor either! Perfect for Instagram and perfect for a refreshing summer treat bursting with flavor! 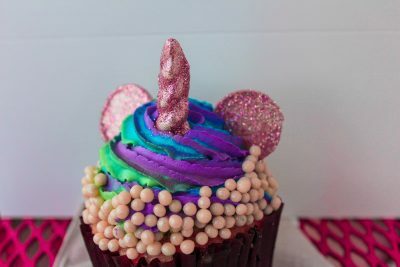 The cupcake has a white chocolate glittery unicorn horn and Mickey Mouse ears to match! 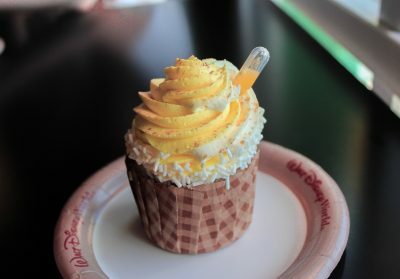 After examining all these new and very creative treats, when it comes down to unique flavor, character, and presentation, my favorite is a three-way-tie between the Pineapple Whip Cupcake at All Star Sports Resort, the Mickey Mouse Unicorn Cupcake at the Boardwalk Bakery, and the Peter Pan Float at Magic Kingdom! I hope you get to enjoy some of these treats yourself next time you visit Walt Disney World! If you try any treats we listed here, be sure to tag us in your Instagram post at @ThemeParkHD! We’d love to hear what you think! Happy treating!! !